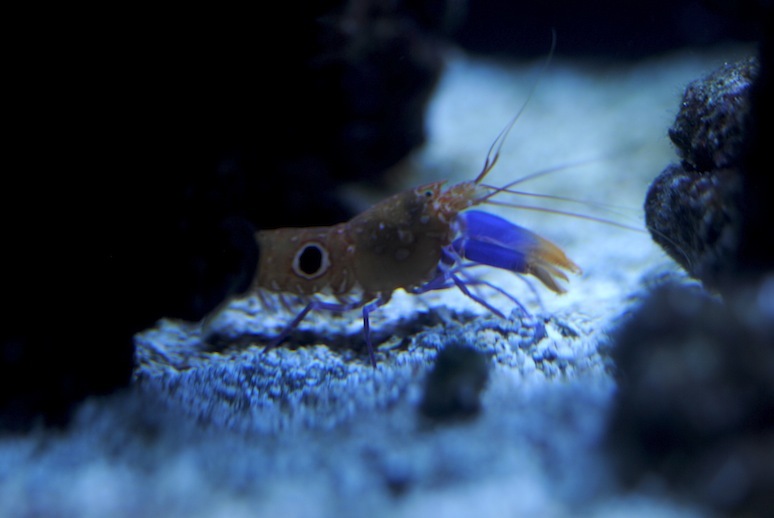 The pistol shrimp, also called snapping shrimp, are nothing new to the hobby. For some reason though, we seem to be innately attracted to these little critters, especially when we find a shrimp and goby pair. It’s neat watching these two go around our tanks, digging their tunnels and watching each other’s backs. Despite this well documented behavior, the bullseye pistol shrimp (Alpheus soror) seems to be a lone ranger. 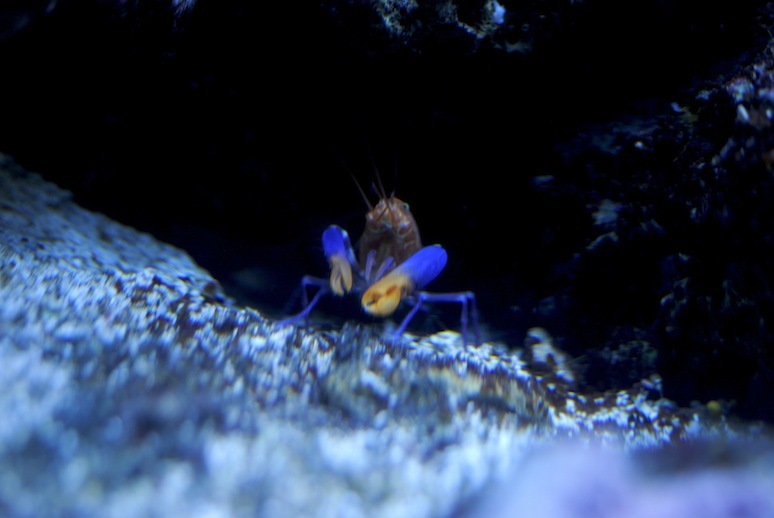 This beautiful species of snapping shrimp sports a yellow-orange body, with bright purple claws and legs, and a perfect black circle mid body. It also has all of the typical characteristics of any other snapping shrimp: offset size claws, loves to dig and burrow, snaps his claw when it feels threatened. There is one thing this creature lacks when compared with its snapping brethren though. 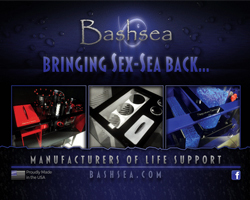 They are not known to pair with any goby, despite the best pair efforts of hobbyists. Having owned a Bullseye shrimp of my own, I’ve observed this behavior first hand. When first encountered at a local fish store, it seemed to be paired with an Orange Prawn Goby (Amblyeleotris randalli). They were both together sharing the same burrow, the goby was at the entrance of the burrow while the shrimp was looking out the other end. Every couple minutes the goby would swim out and go back in to check on his little friend. So after watching them for fifteen minutes and being so surprised to have found a Bullseye shrimp to be paired with a goby, I went ahead and made the purchase. Upon bringing them home and finishing the acclimation process, they both went straight to work soon after their release into the aquarium. Digging and making their burrows took up the next hour of the day, and once they were done they both went into their new home and still paired up. I was happy, but still surprised at what was going on. Then there was a turning point in the situation. After stepping away for a couple of hours, I came back to check on the new inhabitants and watched the goby attempt to retreat back into the burrow. The pistol shrimp snapped at the goby, causing the poor little guy shoot straight out of the tank and onto the floor. After that incident, I decided to take the little goby back to the fish store and actually ended up trading the little Prawn Goby for a good size Yellow Watchman Goby. The hope was that since the shrimp was fairly bigger than his old friend that size would make the difference. Taking the yellow watchman home, acclimating, and then releasing him near the shrimp, the same thing occurred. It has been four months since the purchase of this shrimp and goby They still live in the same tank, but not in the same burrow. The non-pair stay in completely separate sides of the aquarium. Although you do not get the luxury of a shrimp and goby pair with the purchase of the Bullseye Pistol Shrimp, you still get to have such a unique species. Since these shrimp tend to be lone rangers, we see them a lot more often that you would any other pistol shrimp. They don’t have a goby to go out hunting for their food or watching their back, so they are very active, are out and about, and hunt all day and night. Remember to research what you purchase because if you are buying this species of shrimp to observe and enjoy a symbiotic relationship between shrimp and goby, this is not the one to go with. Move Over…. Mixed up Chameleon!